Now that some time has passed (nearly 2 weeks since i’d first started this entry back in the latter 1/3 of feb.) and i’ve gotten some decent bit of sleep with nary a dream about starfish, perhaps we can get on with a blog-post that is more about art&design and game-dev, and less about me rambling about some whatever drek about crabs…or perhaps not, as this is mostly about crabs. A quick Google-search has proved why the phrase “a bad case of crabs” sounded so unsavory to me, despite my having forgotten just what type of health-affliction “crabs” are…but it did seem STD-related. Two words: crab louse. Ewww~ Also know as pubic louse (Pthirus pubis)―make that a double-Ewww o_O ―these minuscule insects are know for inhabiting regions where the sun don’t shine…and i don’t mean Hades, either. (For those with the stomach/curiosity for just what the nasty lil’ sucker look like, click to see a magnified image from wikipedia here~). But, i digress; my main point is not to talk about pest infestations nor the short & curlies, but rather about how some helpful bit of code in C# will save my w-i-p game from a future buried in crabs. Ahem, the decapod crustacean variety…or a least a stylized version of them (note that my featured crab lacks the proper number of appendages, that being 10 appendages total: a pair of chelae pincers and 8 other legs for locomotion). But before we deal with the infestation, i’d like to talk a bit about the design-process of this lil’ critter which i like to call “crabbius”. Around mid-february, i had made a mock-up for a mobile puzzle game based on a “monsters” theme, for which i’d drawn―using primarily adobe Illustrator―a few character puzzle-piece tiles. i’d designed the “monsters” with elements/themes energy, organic, bronze, and ice (from left to right). 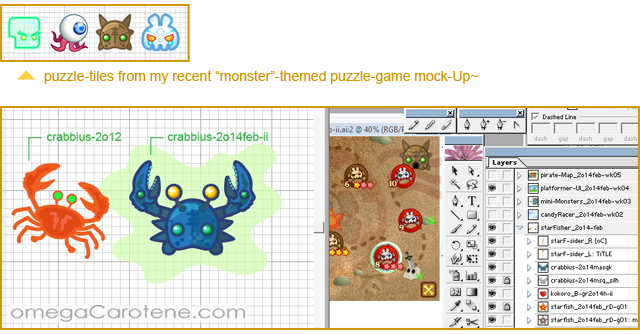 Soon after, as i was creating art-assets for a w-i-p starFish Clam-muncher game that i’m currently building in Unity, the idea arose that i could modify my bronze-element character into a new crab-creature, an enemy of sorts to scuttle about the top-down 2D, sandy playfield of my game. So after frankensteining the chelae from an older crab design, moving some spikes/appendages around, and adjusting some colors―Ta-da: the blue Crabbius that adorns this blog-post~! Now as for the aforementioned crab infestation, suffice it to say for now that a handy bit of properly-implemented Destroy(gameObject) script (thanx to billy’s patient guidance :) ) will avert said potential infestation of infinitely-spawning crabs and prevent them from crawling indefinitely into the desolate, unseen, and untamed regions of my game. 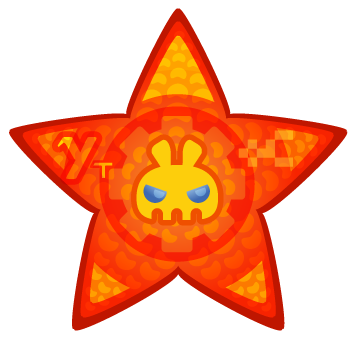 This entry was posted in games, [oC]-designs and tagged adobe illustrator, C#, crabbius, crabs, crustaceans, game dev, games, omegaC, Unity, vector crab, vectorArt. Bookmark the permalink. ← what if one were to throw a Cactuar? 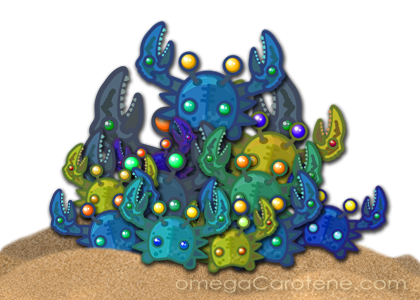 Aah game dev is so cool :D Although maybe not when you have to deal with an infestation of crabs….